A knitter and crafter from a very early age, renowned knitwear designer Rosemary (Romi) Hill's work has appeared in numerous publications and self-published patterns. Specializing in lace, Romi's accessible teaching style, patience and positive approach make her classes popular wherever she teaches. A true believer that knitting should be enjoyable, Romi loves to work with her students to find their own sweet spot: that perfect knitting experience that turns a special pattern and yarn into a fantastic product. Lace or advanced techniques can be daunting, but Romi believes that it's like riding a bicycle. Once it clicks, you'll wonder how you could ever have fallen off in the first place! Everyone needs something a little different to make their knitting experience a special one. Do you like charts or written instructions? Do you like fat yarn or skinny yarn? Merino? Mohair? Silk? Qiviut? What are your favorite needles? Romi works with her students to create a positive and empowering learning environment. Relax as you throw yourself into new techniques and share your own special brand of knitting with your classmates. Romi asks you to release your inhibitions, say good-bye to the Knitting Police, and join in her passion. There might also be some chocolate involved. Born in San Francisco into a long line of crafty women, Romi learned to crochet, sew, and bead in preschool. After being begged incessantly, Romi's mother finally relented and taught her to knit, as well. It was love at first stitch, and she was late to her fifth grade class finishing up her first scarf. She continued to knit voraciously throughout junior high and high school, but left her needles and yarn stash behind when she went east to college. Upon finding a yarn shop near her in Rochester NY, she resumed knitting with a passion during long and sometimes boring recording and editing sessions in the Eastman School of Music control rooms, rehearsals, and class breaks. On the Eastman Philharmonic's German tour and the Eastman Wind Ensemble's tour of the eastern seaboard with Wynton Marsalis, Romi always found the best yarn shops in each new city, purchasing fibery souvenirs and inventing patterns - some more successful than others - and knitting them on buses, planes and trains. After graduating from Eastman and staying to complete an internship program in recording engineering, the siren call of San Francisco led Romi back to a Master of Arts program in her favorite city. Other interests intervened, and she left school to work in the corporate world before going back to school part time - while still working her corporate job - to complete an award-winning thesis and graduate with an MA in broadcasting and electronic arts. Before her escape from the corporate world, Romi worked as a marketing manager for major architecture and engineering firms. It was in this capacity that she became fascinated with - and furthered her education in - graphic design and illustration. She and her husband - a lifelong photographer - founded a small advertising and creative services company, working for clients such as American Express, Franciscan Estates, Geyser Peak Winery, the City of Healdsburg, Kaiser Permanente, Quintessa, Ravenswood Estates, the City and County of San Francisco, Simi Winery, Skyy Vodka, Sony Metreon, VA Linux, and Yerba Buena Gardens. When digital cameras became ubiquitous and Romi's husband - a self-described film snob - left their company to pursue other interests, Romi founded Designs by Romi in 2005, selling shawl pins to hold her newly minted lace shawl knitting passion around her shoulders. 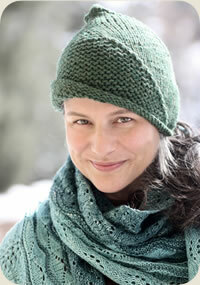 She began designing knitting patterns to gain recognition and support her product line, and her first design was published in knitty.com's eZine. From that humble beginning, Romi has gone on to have her work featured in Twist Collective, Interweave Knits, Knitscene, and numerous other books and publications. Her self published eBooks and patterns have been popular staples of the lace knitting diet, with their clear instructions and knitterly designs. She was the first to offer a serialized “subscription” eBook on Ravelry.com (7 Small Shawls, Year 1), and then to offer the 4th year of that series as an app for iPhone. Romi has also striven to give back to the world. With the help of the knitting community, her pattern Brandywine alone has - to date - generated $26,000 in donations to Doctors Without Borders. Multiple awards for knitting, spinning, illustration, graphic design, writing, and music.